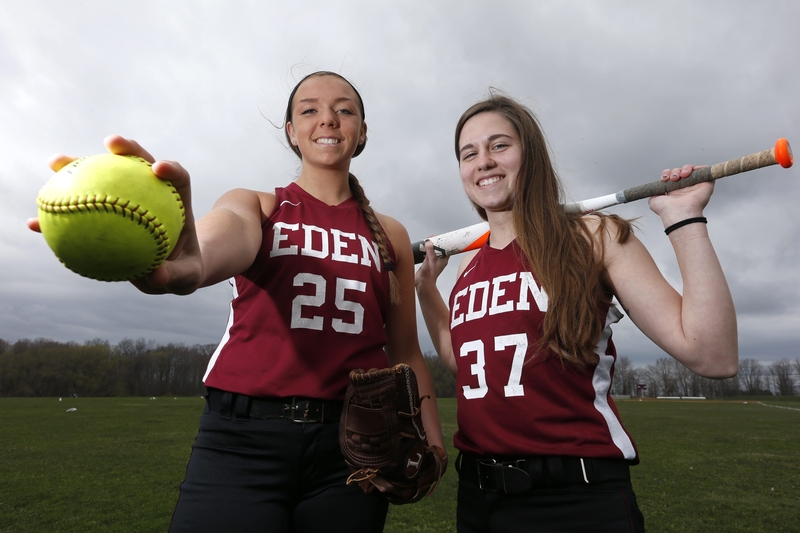 Carly Nasca and Jill Murray helped lead the Eden softball team to the Class B state championship in 2014. Other coaches searching for just one star pitcher must feel envious of Eden’s situation. The Raiders have had a pair of aces up their sleeves for years in senior Carly Nasca and junior Jill Murray. Instead of being rivals, the two have been a friendly tandem helping each other, pushing each other and pulling for each other. Want proof that the partnership has worked? Check out the state Class B championship plaque in Eden’s possession. “They just want us to win,” said Raiders coach Marisa Fallacaro. Nasca, Murray and their teammates want to keep on winning. Eden has 10 returnees from last year’s 18-1 team, but the hurlers who played a role in the Raiders’ first state title might be the most important ones. Nasca, who has signed with Division II Edinboro, finished last season 8-0 with a 0.79 earned-run average. Murray, who is receiving interest from Division I and II schools, had a 0.82 with 136 strikeouts. Murray tossed an eight-inning no-hitter in the state final, scoring the game’s only run on Haley Kobie’s two-out, walk-off single. Both are decent with a bat in their hand as Murray hit .471, while Nasca posted a .433 average last year. Nasca drove in the winning run during Eden’s comeback win in the state semifinals. Murray plays second base when Nasca pitches, while Nasca plays right field when she’s not in the pitcher’s circle. They’ve been a pitching tandem since Murray’s eighth-grade season on junior varsity. Each enters her third season on varsity, with each coming off first-team All-Western New York campaigns. Eden’s wealth of riches extends to the field with second-team all-state and junior third baseman Kobie leading the way. In addition to driving in the championship-clinching run, she hit .525 and had an on-base percentage of .600. Other key returnees include seniors Kelly Staub (first base), Sabrina Kraska (catcher) and Liz Karstedt (shortstop). The Raiders (3-2) need some game action in order to reach the level of play attained last year. Weather has limited them and a good number of Section VI teams to a handful of games. Still, the goal remains the same. Alden and Cleveland Hill are the ECIC IV rivals Eden has already faced this season with the Golden Eagles of Cleve Hill earning a signature win over the Raiders. Cleve Hill (5-1) has lost only to Alden. Key returnees for the Golden Eagles include last year’s top hitter, Hailee James, all-state catcher Emily Maziarz and fourth-year starting second baseman Taylor Kochanski. Alden, which won ECIC IV in 2013 and finished second to Eden last season, is led by senior co-captain Megan Hassenbohler, who will continue her career at Medaille. The first baseman batted .383 last year. Junior pitcher Laura Kratzke’s only losses last year were to Eden, and she was a key member of the 2013 team. Another pitcher who swings a good bat is sophomore Brooke Strausbaugh. Olean (7-1) served notice that it’ll be a tough out in Class A-2 by winning the Williamsville Tournament two weeks ago. A Class B school a year ago, the Huskies’ only loss came during their trip to South Carolina. Leading the way for Olean is pitcher Monica Moses, who has posted back-to-back 15 strikeout games. She earned MVP honors at Williamsville as the Huskies beat Immaculata (5-0), Clarence (4-3) and Williamsville North (10-4) to capture the crown. Olean rallied from a 3-0 deficit to beat Clarence, with Moses driving in the winning run with a sacrifice fly. She went 4 for 4 with a homer in the tournament final. Other Huskies to keep an eye on include outfielder Lyndsey Churakos, shortstop Gabby Carpenter and third baseman Brinee Torrey. West Seneca East hopes to make a long playoff run and has some momentum after rallying for a pair of wins in capturing the title at the Depew Tournament last weekend. The Trojans lost in the Section VI Class A-1 final in 2013 and lost to eventual state champion Williamsville South in the sectional semifinals last year. Key returnees include catcher Rachel Funk, a first-team all-league pick who hit .462. Third baseman Brittany Nowatzki is another key returnee. Pitcher Mandy Manquen, a Mount Mercy transfer, earned MVP honors at Depew. For Williamsville East, Sara Armstrong comes into her senior season after putting up a .469 average last year. Eighth-grader Christy Mack hit .371 and drove in 12 runs during half a season with varsity last year. Defending state Class A champion Williamsville South has won three of its last four to improve to 5-6. Senior captains Aimee Lavere, Carlie Scime (.422 average), Rachel Whalen and Nicole Rice (.545) are among six returnees from a Billies squad that graduated seven. Freshman Kate Quagliana has made an immediate impact, batting a team-leading .556. The Billies have just two returning starters, which means the lineup is fairly inexperienced. Still, coach Julie Murphy expects the team to be playing its best come postseason. The Clarence Red Devils aren’t getting ahead of themselves even though they return eight, including six starters, from last year’s state Class AA semifinalist team that went 20-2. Shortstop Gabby Keller is batting .833 with six doubles and a triple, while fellow junior and third-year starter Ashley Carney is batting .529. The big loss for Clarence is pitcher Katrina Buczkowski to graduation. Looking to fill her shoes is junior Christina Victor. Clarence has won at least a share of ECIC I nine times the last 11 seasons, including five in a row under veteran coach Todd Banaszak. Orchard Park, a team Clarence beat during last year’s postseason run, has 10 returnees who are determined to unseat the Devils atop the division. Three of those Quakers have signed with Division I teams: fifth-year shortstop Shaye Swiatek (Albany), fourth-year starting catcher Katie Weimer (UB) and starting pitcher Molly Hennessy (St. Bonaventure). Frontier is another squad taking aim at Clarence. Three-year starter, captain and second baseman Courtney Courtade has signed with Albany. Pitcher Olivia Nappo is a four-year starter, while third baseman Lexi Simmons is a three-year starter. Lancaster returns 11 players from last year’s squad that lost in 10 innings in the sectional quarterfinals to Niagara Falls. Among seven seniors on the team is Olivia Jankowski, who was batting .870 (20 for 23) through her team’s first six games. She has signed with Edinboro. “The hottest start to a season I’ve had out of a player in my coaching career,” 11th-year skipper Kelly Ambrose said. Senior lefty Kaitlin Surdej is 6-0 with 49 strikeouts, five walks and 0.20 ERA. Kenmore West rallied for a 14-10 extra-innings win over Niagara-Wheatfield last Friday, a contest in which newcomer Emily King drove in three of the Blue Devils final nine runs. Key returnees for Matt Chimera’s squad include Lina Mirabella, Abby Borkowski, Grace Ferguson, Brianna Christopher, Haily Battaglia and Allie Chimera. Lockport has nine seniors among its 13 returnees hoping to reverse fortunes after last year’s 3-14 mark. Names to keep an eye on include third baseman Jordyn Kwoka and first baseman Alyssa Wagner, who posted a .962 fielding percentage last year. • Williamsville North catcher Jess Mucci, who has a .316 career average, will attend the Air Force Academy after graduation. • Junior captain Maddie Tucker has proven quite versatile for Starpoint, having already pitched along with playing games at second base, third and shortstop. • Returning catcher Maddy Crandall and freshman shortstop Emilee Hanlon hope to lift Dunkirk over .500. Hanlon also is running track and field at the same time as playing softball. “So far it’s been working out in both areas,” Dunkirk coach John Silva said. • Senior Maddie Aston, Amherst’s starting catcher since eighth grade, has signed to play at Canisius. She is one of two seniors on a Tigers crew off to a 4-0 start. • Iroquois’ Amanda Metz and Jamie Ward will go from being a longtime battery to opponents in college. Metz, the Chiefs’ fourth-year pitcher, has signed with Edinboro, while Ward has signed with Mercyhurst. • Lake Shore started 3-1 start under first-year coach Vincent Fininzio. Fifth-year starter Darian Evans is batting .611 with 10 runs scored, nine RBIs and five doubles. • Maddy O’Heir posted an 8-2 mark last year as an eighth-grader for Maryvale. She also hit .480 with 11 RBIs, .519 on-base percentage and .600 slugging percentage.